Memphis rapper-producer DJ Paul has teamed with fellow M-Town beatsmith Drumma Boy to drop their 18-track project, Clash Of The Titans. Hosted by DJ Scream, the mixtape features guest performances from 8Ball, Crunch Black, Jelly Roll, Young Dolph, Trae Tha Truth, Gangsta Boo and Gorilla Zoe, among others. 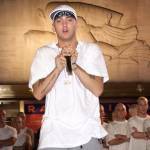 Earlier this year, the duo released a video for “Him Vs Me,” the third track from the mixtape, which featured a cameo from Featherweight World Champion boxer Abner Mares. A co-founder of Three 6 Mafia, DJ Paul is also working on Da Mafia 6ix, a group with one-time Three 6 Mafia members Gangsta Boo, Crunchy Black, Koopsta Knicca and Lord Infamous, but not including fellow Three 6 Mafia co-founder Juicy J. In an exclusive interview with HipHopDX, DJ Paul said that Da Mafia 6ix is not Three 6 Mafia reunion because Juicy J is not a part of the album. Drumma Boy has worked with Waka Flocka Flame, Future, Don Trip and T.I. among others. 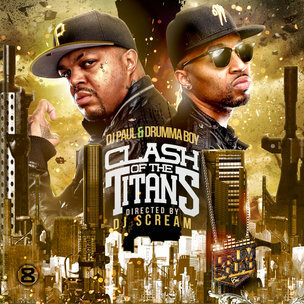 Clash of the Titans can be downloaded at DatPiff.com.